My child may only be three, but she knows exactly what she wants. 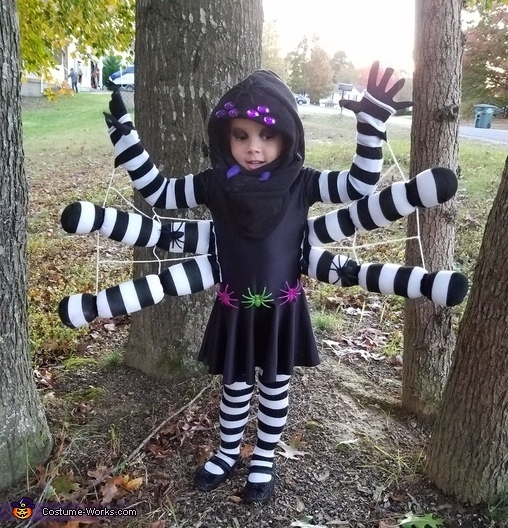 Long before Halloween, I anticipated she wanted to be Twilight Sparkle from My Little Pony because she loves that show, but then two months prior to Halloween, she decided that she wanted to be a spider (thank you Curious George Boo Fest Movie)! Honestly, I was as excited as she was about being a spider and surprised that she chose something like that all on her own. However, when we started looking at spider costumes available, I just felt none of them would do. If she was going to be a spider I wanted it to be unique and just for her. I went to work finding ideas online about how to make a spider costume. I viewed pictures and thought about materials that could be used and came up with a concept, keeping my eyes out for materials and inspiration whenever I went shopping. I found tall striped socks in the Target dollar section that would be perfect for spider legs. I picked up some black pipe cleaners to act as the joints of the spider’s legs and some polyester fiber fill to stuff the legs with. I decided on a black dance leotard for the spider body and a children’s fleece balaclava for the head as I knew it would be cold outside and she could use both the leotard and balaclava for other things afterwards. I considered the ‘google eyes’ for spider eyes, but since purple is her favorite color, I chose purple sew on gems instead, figuring I’d just put some purple eyeshadow on her eyes to make eight spider eyes. I also picked up some white yarn to act as webbing between the spider’s legs and to connect the legs to her arms, so that when she moved her arms the other legs would move, too. After gathering most of my materials and beginning construction on the legs, I began to contemplate how on earth I was going to attach the legs to the leotard. After all, she is a three-year-old, who will most likely tire of spider legs being attached to her body and will get grumpy about it. Then I thought about buttons. I picked up some buttons and after stuffing, jointing off, and sewing the ends of the four spider legs I cut slits into them and sewed around the slits heavily to make button holes (mind you I’m no seamstress, so all the sewing I did was done by hand and wasn’t pretty, but functional). I should note that prior to making joints and sewing the ends of the socks I eye-ball measured them with her arm length because they were too long and needed to be cut shorter to match up with her arm length. Now that the legs had button holes and the leotard had buttons I took the socks that would go on her arms and cut them to length with a small slit for her thumb to go into, so they would act as long fingerless gloves. We bought a child’s pair of black gloves to cover her hands. Once construction of the legs was completed I put her arms sleeves on and buttoned on the side legs to determine where I would need to attach the yarn and cut it to the right length. After cutting the yarn to length, I sewed the yarn in place (while the costume was off of her). I then added a thread of yard in between each arm to make it look more like webbing and not just strings holding the arms together. After sewing the purple jewel eyes onto the balaclava (head piece) I still felt like something extra needed to be added to make her costume even more unique. I happened to find some colored plastic glitter spiders at Spirit Halloween store and thought they would add a nice touch. I also picked up some purple felt to make some small spider fangs (I had to look up YouTube video on how to make devil horns to understand how to sew them). I hot glued a piece of black felt to the under-side of the glitter spiders to have a way to sew them on. I sewed a black spider on her head and a couple more on her spider arms to make it look like smaller spiders were crawling on her and used the colored spiders as a “spider belt”. Once I cut and sewed up the fangs and stuffed them with some fiber fill I sewed them onto the head piece close to her mouth and voila! The costume was complete. The costume turned out to be a major hit! Everyone who saw it loved it and she loves wearing it and was so proud of her costume, which is the most important part to me.